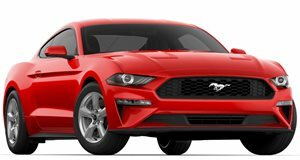 It’s hard to experience the undiluted blend of love and hate more plainly than when strapped into the heavily bolstered Recaro seats of a 2019 Ford Mustang Bullitt while the sound of wind buffeting invades the cockpit through a driver’s-side window left open just a crack. Oscillating pressure inside the cabin made mincemeat out of eardrums and even though it would have been easy to relax my white knuckle-grip on the wheel to shut the window while traveling at speeds too ludicrous to mention, it was the aural treat of the reworked 5.0-liter Coyote V8 that gave reason to persevere. Since Bullitt hit the big screen in 1968, San Francisco has become a city that keeps the masses out through prohibitively expensive living costs and a pace of life that’ll turn youthful thick black hair brittle and grey—a far cry from the easygoing peninsula that gave Warner Brothers and Steve McQueen the keys to the city so the pair could shoot one of film’s most iconic chase scenes. It’s for that reason that Ford invited us to drive the 2019 Mustang Bullitt through Northern California’s most iconic driving roads instead of the populated San Francisco hills that once sent McQueen and his Mustang flying—somewhere we wouldn’t bother likely Ford stockholders and general members of the 1%. As the third Bullitt in the Mustang story, the first two being released in 2001 and 2008, the 2019 Mustang Bullit commemorates the film’s 50th anniversary and simultaneously reminds us that the current fastback ‘Stang’s design is so dang good it can yank all eyes to it whether slathered in bright colors and loud stripes or subdued by the removal of chrome horse-shaped badges and the application of dark shades of green or black paint. Unlike a clip from Michael Bay’s latest breastaurant shoot-em-up thriller, Bullitt, both the car and movie, is the essence of the gentleman badass—thrice distilled and remaining static under pressure. The Mustang Bullitt is the virility of adolescence with the poise of an Ian Fleming double-0, unleashing fury with bullseye precision enabled by a steady hand. To keep with that ethos, Ford didn’t do much to the exterior when it came time to outfit the latest iteration of the Mustang GT with Bullitt clothing. Though buyers can choose to have the body painted in Shadow Black if the original movie car’s Dark Highland Green won’t do, Henry Ford will be happy to hear that there is only a single trim option: gloss black. Subtle chrome accents provide a glimmer of light to the sea of dark paint and lines the outer edges of the grille, borders the edges of the side windows, coats the “Bullitt” lettering and bullseye logo at the rear, and surrounds the lips of retro 19-inch wheels that’ve had their faces painted in Henry’s favorite shade of black. Behind those rims are the only inconsistencies in the color palate aside from the orange turn indicators up front: red Brembo brake calipers put in place to remind occupants that frictional forces provide a better insurance policy than any policy Geico can muster. With the Bullitt able to reach a top speed of 163 mph provided the driver has enough runway and gall, there’s legitimate need for that kind of stopping hardware, but evidence of this Mustang’s bloodlust won’t be found inside the mature dark interior. Whether fitted with the standard black leather seats or the optional bolstered racing seats with green Recaro logos stitched into hide to match the threaded trim of the door panels, dash, and center console, the only real hints that this ‘Stang is any different from a regular Mustang GT come from liberal splatters of the word “Bullitt” around the cabin. It comes engraved into the chrome doorsills, the bullseye logo that replaces the pony on the steering wheel to match the faux gas cap at the rear, and is placed on a plaque that contains the vehicle’s chassis number positioned where it will either impress or be looked over by passenger seat inhabitants. Aside from that, it’s up to a white cueball shift knob, echoing the one McQueen’s right hand violently jerked around while he was chasing a black Dodge Charger containing two fleeing assassins, to remind those lucky enough to sit inside this ‘Stang that it is more special than a GT. 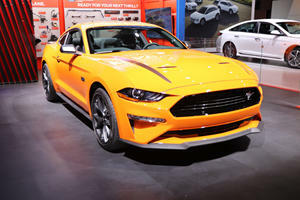 The six-speed manual from the GT, the only available transmission option, was reworked when the pony car underwent its 2018 facelift and while it doesn’t make the fastback coupe as easy to hustle around town or track as a Mazda MX-5, it fixes the finicky clutch and vague engagement point of the previous six-speed to the extent that it gives this generation of Mustang a new lease on life. An added bonus: a rev-matching function can make three-pedal novices look like the real McQueen during downshifts. And then, as if the sleek muscular Mustang body in a ninja outfit wasn’t enough, there’s that fantastic Coyote V8 to take in. 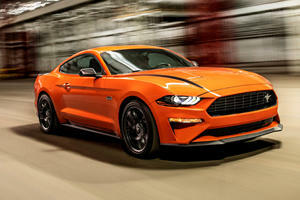 Using nothing more than the 87mm throttle bodies from the GT350 and an ECU retune, Ford coaxes an extra 20 horsepower out of the naturally-aspirated 5.0-liter V8 for a grand total of 480 ponies. Torque remains steady at 420 lb-ft, but those numbers almost seem arbitrary when the new active exhaust starts to pipe up and lends its take on the 1960s through the four Black Nitro Plate exhaust tips. It may be hard to believe if you bought all the marketing jumble about flat-plane crank V8s having superior soundtracks to cross planes, but trust when we say that this 5.0 sounds better than the 5.2-liter Voodoo in the GT350. Yes, the track-bred GT350’s redline is a total treat—sounding like a bucket of bolts in a blender, each one shouting at the rest to spin faster and hit that magic 8,200 RPM mark—but the Bullitt’s impression of a carbureted Ford V8 from the late 60s yields the crisp sonorous bass of collected anger, a highly irritated radio voice muffled by the nostalgia of a hotrod-era sepia filter. Since the Bullitt’s V8 delivers horsepower linearly, there’s plenty of incentive to dig into the throttle for another soundbite after each apex is dealt with. It’s there, in the throes of the wrestling match between human and machine where Mustang shoves driver into buttery leather seats and driver responds by pinning throttle to firewall, straining tendons and stretching Michelin Pilot Sports while a violent vice grip clutches the cueball shifter and steering wheel, that nirvana is found. In that frame of mind, even the most sane of Bullitt drivers will find themselves bounding past dark green Volkswagen Beetles on the hunt for black Dodge Chargers. With the Mustang GT Premium and Performance packages coming standard on the Bullitt and adding those colorful Brembos, a beefed-up anti-roll bar, a larger radiator, and a limited-slip differential, this version of the Bullitt Mustang might even catch up to the bad guys before leaving city limits. The most enticing difference between the new and old Bullitt is that the new car wields the spoils of modernity to compartmentalize its personalities, dealing with San Francisco’s chaotic density with easy shifts, a soft suspension and the convenience of Ford’s SYNC 3 infotainment while stowing its manners and pulling out some aggression on the winding roads of Skyline Boulevard. With numerous ways to alter the variable hardware loaded onboard, a driver can customize steering weight, steering sensitivity, exhaust loudness, and suspension stiffness (provided the box for the optional MagneRide damping suspension is ticked) using steering wheel buttons and the 12.4-inch digital gauge cluster or by toggling through the long list of drive modes that include Normal, Sport, Drag, Track, Snow/Wet, and two customizable MyMode settings. As one might expect, none that kind of kit does not come cheap but stays within reason by not straying too far north from the base price of a loaded GT. The Mustang Bullit starts at $47,590 including destination (essentially $5,000 more for the Bullitt outfit, 20 extra horsepower, and an exhaust that rattles off aural masterpieces), but the price needle can be pushed forward by adding a few features. The first $2,100 buys the Bullitt Electronics Package, which includes blind spot monitoring and rear cross-traffic alert, a 12-speaker H&K sound system, ambient lighting, and the full suite of SYNC 3 navigation features. The worthwhile MagneRide damping system piles on another $1,695 while the bolstered Recaros add $1,595, pushing the grand total to $52,980. That might be a lot of money for a Mustang, but the Mustang Bullitt is a lot of car. Stuck in Golden Gate traffic on what’s arguably one of the most eminent sections of California’s famous Highway 1, a curiosity took place. Flanked by two Hertz Mustang convertibles, those EcoBoost models that are rented out to tourists so they can experience California the way they think locals do (you can spot them by watching for retracted convertible tops in dreary jacket weather), it was the Bullitt that bridge crossers launched their pointed index fingers and camera lens towards. The Bullitt’s shade of downcast green could hardly win a shouting match against tints of Ruby Red and Triple Yellow sported by the rentals, but it was the hearty chortle of the 5.0-liter, the faint scent of smoke slithering from the singed rear tires, and the maniacal laugh yours truly was sending into the San Francisco Bay that projected McQueen’s star power onto a bridge full of guests wanting to see what America is all about.